Large enterprises the world over are lagging behind in software product innovation, due to being slower to adapt to changes in the market than their smaller competitors. "Coincidentally", these smaller companies are increasingly adopting Agile, allowing them to react faster than global juggernaut enterprises. Not surprisingly, large companies are also looking to jump on the Agile bandwagon – but are worried that agility would come at the price of sacrificing their tried and tested organizational structure and fully controlled processes. Related reading: SAFe or Scrum at Scale – Which Framework is Best for You? That's because implementing Agile in a small team is a huge enough (and deeply rooted) change in itself. 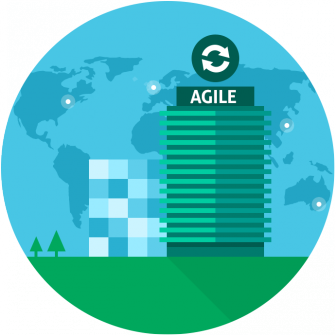 But for large, global enterprises with teams dispersed in various regions and countries, scaling Agile is an even greater challenge. If they want to keep their orchestrated, well-managed teams aligned, they can't just have each team or regional branch make the transition to Agile on their own, and hope that product development will still work out. They need a controlled way to coordinate the transition to Agile in all their teams. It is exactly these large enterprises that SAFe® was designed to help. The Scaled Agile Framework, developed by Dean Leffingwell & his team, is basically a highly structured and prescriptive method that helps large organizations become more Agile. Notice that we said "more Agile": some think that having implemented SAFe, you're not really using true, 100% Agile – but most agree that it's a great step forward. On the other hand, the Scaled Agile Framework is ideal for enterprises, as it provides a structured transition process, and allows these companies to stay in control of all internal development processes (and retain some of their organizational structure) while also providing development teams with enough freedom & flexibility to be Agile. However, implementing and scaling Agile is just part of the story. The primary reason for making the transition to Agile is, of course, increasing the efficiency of your teams and eventually, the profitability of your company. While your previously used workflows may not be suitable in this new Agile environment, it can still be important to enforce certain processes in order to ensure efficiency and profitability. This is especially true for companies operating in regulated industries (safety-critical sectors such as automotive, medical, or aviation development), where compliance with relevant industry standards is imperative. Whether the aim is to comply with regulations, or just keeping certain cornerstones of tried and tested processes, some companies choose to go with Hybrid methods. These Hybrid processes essentially combine Agile and certain Waterfall elements (or parts of other methodologies), creating a custom process that best suits your needs and requirements. Once again, some Agile enthusiasts will say that in doing so, you're moving away from Agile – others claim that Agile is all about flexibility; just use whatever works. They basically say that whether or not you're "really" Agile is of secondary importance: all that matters is that your lifecycle is efficient at creating value. We'll leave this to you to decide, as whatever the case, codeBeamer ALM can help you streamline your processes. Using preconfigured templates, codeBeamer ALM allows you to combine SAFe and industry-specific solutions. Intland's SAFe® Template can be used together with any of our industry-specific templates (the Medical IEC 62304 & ISO 14971 Template, the Automotive ISO 26262 & ASPICE Template, or the Aviation DO-178C & DO-254 Template). In essence, this enables you to define and enforce specialized, compliant processes, keep thorough documentation, and export reports to facilitate compliance audits – while scaling Agile across a large organization. Interested in learning more about implementing & scaling Agile in a regulated market environment? Get in touch with us for more info, or start your evaluation of codeBeamer ALM.